Back in the late 1920s, Hollywood’s road from silent films to talkies was a bumpy ride. Studios were initially slow to embrace the evolving technology, and some of the moguls even dismissed it as a fad. It wasn’t, of course, and moviegoers soon clamored for more noise. But there’s an old adage that cautions to be careful what you wish for. And when some of the superstars of the silent screen opened their mouths for the first time with a microphone, audiences were, well, not happy with what they heard. Some of the most beautiful people in the world were plagued with voices that just didn’t work for audiences who had heretofore been supplying their own voices in their heads. So when their favorite star suddenly opened their big, beautiful mouth and a tiny, squeaky voice eked out, or when the sound was plenty powerful but was nearly unintelligible because of a very thick, foreign accent, well, it was a bit of a put-off for early moving picture patrons. So some very successful actors and actresses faded into obscurity, and other, fresher faces with more audience-friendly voices rose to prominence. And there were also some who successfully made the transition and went on to have long and gloriously clangorous careers on the big screen. 1952’s classic musical comedy, Singin’ in the Rain, takes a peek and a good-natured poke at that painful point in movie history. Gene Kelly plays Don Lockwood, a very popular silent film star who rose from the ranks of a lowly song and dance man to become first a stuntman in the movies, and eventually a leading man. Jean Hagen plays his on-screen partner Lina Lamont, whose beauty and grace on-screen are matched only by her vapidity and shallowness off-screen. Believing the studio’s publicity stories, Lina is convinced that she and Don are romantically entwined and even engaged to be married. Don’s disdain for Lina is a simmering pressure cooker of contempt, but he wears a happy face for his adoring public. In fact, it is the excessive adoration of some fans one evening that forces Don to escape a street corner frenzy by jumping into the passing car of Kathy Seldon (Debbie Reynolds). Kathy happens to be a stage actress and has little respect for the tripe that passes for talent on the silver screen. Later that evening, Don is more than a little amused when Kathy jumps out of a cake at a party he’s attending at his producer’s, and a delicious confrontation unfolds among Don, Kathy and Lina. Happy-go-lucky Cosmo Brown (Donald O’Connor) is Don’s best friend since childhood and his former vaudeville partner. Cosmo also works in the movies, originally playing the piano on set for the actors in the silent days to set the mood for their performances, but now he’s been promoted to produce musical scores for the new talkies. His first project is helping to turn Don and Lina’s latest silent film, The Dueling Cavalier, into a talking picture. It’s a disaster plagued with technical problems, a hokey script, growing tension between the two stars, and a blossoming romance between Don and Kathy. And then there’s Lina’s voice (refer to the first two paragraphs in this review). So Cosmo, Don and Kathy conspire to turn The Dueling Cavalier into a musical instead, The Dancing Cavalier. Things get messier and funnier, and a lot of sensational singing and dancing ensue. Top to bottom, this movie is a Hollywood musical comedy at its best. Donald O’Connor is ridiculously funny throughout, conjuring comparisons to some of Danny Kaye’s best performances. Debbie Reynolds is sweet and charming, and Jean Hagen is hilariously grating, despite actually having a wonderfully rich voice in real life. The title song of Singin’ in the Rain was not written for this movie; rather, the movie was written with most of the music already in mind, and writers Adolph Green and Betty Comden fashioned a story around songs they wanted to use. 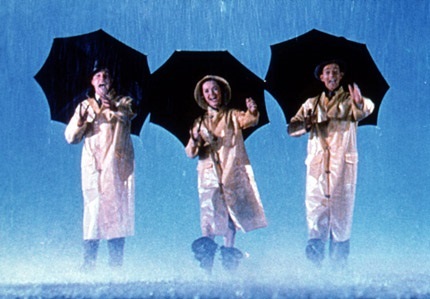 “Singin’ in the Rain” actually appeared in no less than six other earlier films! Directing duties were shared by Stanley Donen and Gene Kelly, the latter obviously also starring in the film, and also choreographing the many fantastic dance sequences. Kelly was, without question, quite the taskmaster on set, with shooting days often lasting upwards of 19 hours. But his requisite for excellence was also self-imposed, and his amazing performance of the title song is proof positive. The number took all day to set up and was very complicated to light. Only rudimentary blocking of the scene had been done prior, which really only amounted to where he was supposed to start and where he was supposed to finish. With the stage set, Kelly insisted on doing a take, and then proceeded to improvise the entire number with the cameras rolling. There was only one take, and that’s what you see in the film, a fact made even more amazing when you know that Kelly was also running a fever of about 103 at the time.